For Tea Day one of our corporate sponsors, Toyota Ireland, loaned us a small 4×4 which we had covered with decals of tea pots and tea cups for added publicity. It attracted a lot of attention and yours truly got to drive it for the three months leading up to the big day as I visited each branch of the Society all over the country. “Oh, I do, Mr Haughey. Well I don’t own it, Toyota do. They loaned it to us for Tea Day. It’s great for added publicity,” I gabbled adding “it’s their new RAV4,” assuming most men like discussing makes and model numbers. Fascinating! Sounds like a scene from a movie that I really want to watch. Well written as usual – “Grand little blog for a woman I suppose” Tee Hee…or Tea Hee Mobile !! Oh I remember that excitement well! Your Dad's I mean not yours! You do know you also made it on TV that day saw it recently on some biog of Charlie or reeling in the years not sure which. Maybe it was 'Important people I have met by Charlie Haughey'? ps. I had coffee with Mary McAleesse last month in the Aras with my trainees!!! That was a great story, Barbara, really enjoyed it. Gulp, I gave you an award on my blog today 🙂 I know you already got it but I want to know more about your interesting life! I remember well the husband's excitement. You made up that day for not getting a steady pensionable job in the civil service which was where Michael thought you would really love!!! Poor old Charlie, him and his delusions of grandeur. Still he gave us pensioners free travel. What about asking your readers who would they like to take tea with …. and why?? Hi there, I followed your link from Karen's site. I really liked the story. The cat also! If you don't mind, I'm going to tag along. Well aren't you the brave woman to enter the shark's playground. Well done for surviving! Great story Barbara. He was a small man wasn't he!!! Ha Ha… good ole CJH still has great pulling power judging by the number of comments already! Thanks all and glad you enjoyed the story. For my American readers Charles J Haughey was a man from humble origins (like the dad) who rose through the ranks of politics in this little country of ours. With one major detour along the way (when he was caught smuggling arms into the country – and he a Govt Minister) he finally became Taoiseach. He ruled with an iron fist, conducted an affair with a prominent journalist which was unspoken common knowledge certainly around Dublin and took money from all and sundry to fund his distinctly West Brit lifestyle (huntin, shootin, fishin) in his mansion called Abbeyville. He retired from politics just as his empire started to crumble. 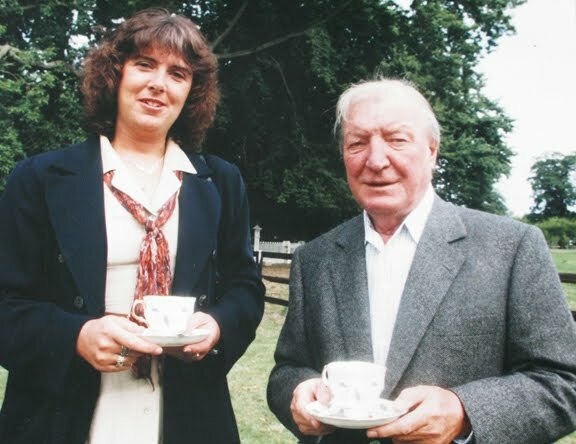 He died some years ago but although I couldnt condone his methods, his was a colourful and larger than life figure (although that wouldnt be that hard) who strode across Irish public life for decades. But more than all that… my father taught he was a grand fella!!!! Finally – again thanks for the comments.. and welcome Pat – hope you pop by regularly and CLIVE (woof woof) really honoured to have your company!